Commercial Vehicle Accidents | Miami Truck Injury Lawyers Gerson & Schwartz, P.A. Contact Aventura Trucking Crash Attorney Gerson & Schwartz, P.A. Major highways like I-95, I-75, and the Florida Turnpike connect Florida. These highways are heavily traveled by commercial operators and trucking businesses and unfortunately accidents happen. When a commercial vehicle is involved a thorough investigation of the accident scene, vehicles involved, and people are just the first steps. Many commercial operators and larger corporations have risk managers and investigators that are notified to arrive at the scene as soon as an accident occurs. Over 43 years of experience gives us the knowledge, insight, and understanding dealing with a commercial vehicle accident case. Whether a serious or catastrophic injury occurs our Miami, Florida commercial vehicle accident attorneys are here to help. The personal injury attorneys at Gerson & Schwartz, PA are familiar with federal motor carrier and other safety regulations that apply to commercial vehicle operators. Regulations from the Interstate Commerce Commission and Federal Motor Carrier Safety Administration give motorists some protection. Yet, every year more than 4,000 Americans are killed by commercial vehicles like tractor-trailers, 18-wheelers, and other trucks used for transport. There are over 11 million registered large commercial trucks on the road trying to meet the deadlines of big corporations. One example of a safety measure that is frequently violated is the regulation limiting the number of hours per day a truck driver can be behind the wheel. Present regulations permit 11 hours per day because truck driver fatigue is a substantial contributor in many crashes. In fact, studies show that after eight hours, the risk of a truck accidents doubles and driver fatigue in general accounts for 30 to 40% of truck crashes. Efforts by consumer groups to lower the daily hour limit to 10 hours or less have been defeated by powerful commercial interests. Both truck drivers and the motoring public would benefit from shorter hours and other regulatory measures to combat the effects of truck operator boredom and distraction. Other factors that jeopardize the safety of pedestrians and motorists by commercial vehicle accidents are driver intoxication, driver error, equipment failure, unsafe vehicle operation, unstable loads and defective equipment. Violations of the safety laws implemented to prevent such factors can lead to serious accidents, injuries, and even death. The data shows 70% of all people killed in a truck accident were occupants of another vehicle. The large size and weight of trucks, injuries mean the injuries inflicted are often serious including brain damage, burns, amputation and paralysis. At Gerson & Schwartz PA our lawyers are familiar with the laws and regulations pertaining to commercial vehicles and truck accidents. We know the rules that truck companies are supposed to follow to ensure the safety of their drivers and the general public. However, we also acknowledge that some of the regulations that are in place are not as effective as they could be. We have courtroom-tested experience getting justice for victims in commercial vehicles, big rigs, tractor trailers, and other types of truck accident collisions. 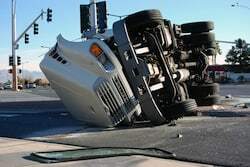 If you are an accident victim, you need expert representation by attorneys who understand the complexities of commercial accidents like truck accident liability. Over four decades of experience gives us knowledge and understanding of federal motor regulations to provide effective legal representation to prove a claim involving serious injury or death. We want to make sure our clients receive full compensation for injuries. We will dedicate time in finding all parties that can be held legally responsible for damages from accident. If you have been injured in a truck or motor vehicle accident, the law firm of Gerson & Schwartz, PA is here to help you. For an immediate, no obligation, and free consultation contact us at (877) 475-2905. Gerson & Schwartz, PA represents injured victims throughout the state of Florida including Miami-Dade, Broward, Orlando, Homestead, Naples, Miami Beach, Fort Lauderdale, Boca Raton, Fort Meyers, and the Florida Keys.